Let’s talk about the 401k. With a name like that, no wonder so many people don’t know what is a 401k! Here you will learn more than you ever wanted to know about them. After reading this post you’ll know what a 401k is, what they are used for, and why you should have one. We’ll admit it, with no one to teach us about money and personal finance at home growing up, we waited too long to take advantage of the 401k. In fact, when Camilo started his first job after college as an investment banker at J.P. Morgan in NYC, he didn’t sign up for the company 401k. Having studied finance at the Wharton School of Business, he understood the importance of saving and investing, but he didn’t fully understand what a 401k was. In fact, he thought he was making the smarter move by not contributing to the 401k. After reading the fine print, he realized that he wasn’t eligible for the company match until he completed 1 year of service. So his plan was to wait until his 1-year anniversary to sign up. In the interim, he invested some of his extra income in a taxable investment account. That sounds, reasonable, so what’s wrong with what he did? Not utilizing a 401k can be a costly mistake! The problem was that at the time, he didn’t realize that a 401k has tax advantages. So he ended up paying more money in taxes by not taking advantage of his account. A lesson we had to learn the hard way. Thankfully, we wrote this article so that you don’t make the same mistake he did. A 401k is an employer-sponsored tax-favored retirement account that you contribute pre-tax wages into (called “elective deferrals”) . Employer sponsored means that the company you work for organizes the plan and helps to administer it. To keep it simple, tax-favored basically means that the government will allow you to pay less taxes if you invest using this plan compared to making the same investments outside of a tax-favored account. Your contributions are typically taken directly out of your paycheck via payroll deductions prior to tax withholding. One of the best features of 401ks is that employers can contribute money in addition to the money you put in! Some employers will match the amount that you put in, which increases the amount of money going into the account each time! Yes, you read that correctly. The company you work for may offer to match the amount you put in, and it will not cost you a dime! If your company matches your contributions, there will almost always be a cap on the amount that they will match. There are different types of 401ks, but we will focus on the most commonly used, which is the Traditional 401k. In 2018, the limit you can contribute is $18,500, which would be hard to reach for most young professionals. Unlike Roth IRAs, there is no income limit to contribute to a 401k. The one exception to the contribution limit is that once you turn 50, you can make catch-up contributions if you did not max it out in prior years. But the rules may change by the time we turn 50. If you reach age 70½ and have not retired, you are required to take distributions. Once one of the above criteria are met, the distributions (payments to you) are either done periodically (scheduled) or non-periodic (e.g. one lump sum per year) depending on the terms of your particular 401k. The distribution amount is determined by a plan administrator and takes several factors into account such as your life-expectancy. See the IRS’s Publication 575  for details. Early Withdrawal takes place when you take funds from your 401k before age 59 ½. Typically there is a 10% early withdrawal penalty on early withdrawals, on top of income taxes. For a list of some exceptions to avoid the tax on early withdrawals see below. These are only some of the exceptions, so make sure to check the full list before taking an early withdrawal. What if my company doesn’t offer a 401k? If you work for a non-profit organization such as schools, universities, churches, charities and hospitals that are 501(c)(3) organizations, they may offer a 403(b) plan. This is their equivalent of a 401k. They may offer a match, much like a 401k. A company may have one or the other, but cannot offer both a 401k and 403(b) to their employees. If you are not sure what your company does and does not offer, ask your HR (human resources) department! Do not worry if your company doesn’t offer a 401k retirement plan! Many employers don’t. If your employer doesn’t offer any retirement plan like a 401k or a 403b you will have to save for your retirement in a different type of account. The IRA (Individual Retirement Arrangement) was created specifically for people to save for retirement on their own. There are contribution limits and other factors to take into account, but you can learn everything in our IRA guide here! Should you participate in your company’s 401K plan instead of investing in your own IRA or taxable investment account? Long answer: It’s your hard-earned money and you definitely have choices! You can opt out of your employers 401k or 403(b) and max out your IRA or invest in something else. Here at The Finance Twins, we think you should definitely take advantage of your company’s 401k or 403(b), especially if they will match you! That is free money they are throwing on the table and walking away from that is like walking past a $20 bill on the ground! What we’d do is contribute enough to earn the full employer match and then work on maximizing our IRAs (see our post on IRAs!). Thanks for reading! 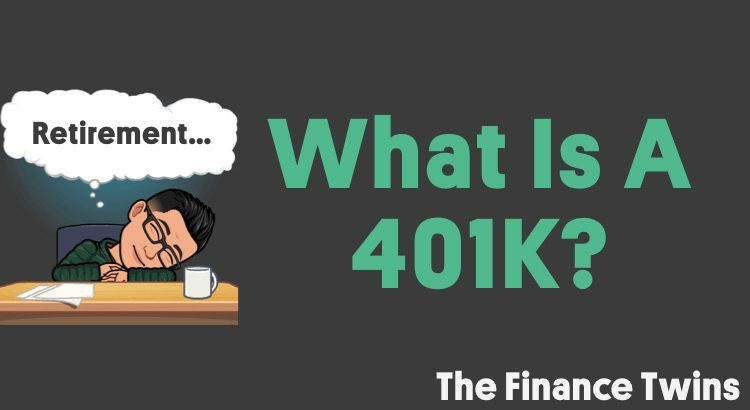 You should now be able to answer the question of ‘what is a 401k?’ the next time someone asks you! Question for you: Does your company offer a 401k? Comment below to let us now! Thanks for this. Embarrassingly, my company (a foundation) offers a 403B but I never knew what it was. I now realize I need to go and set it up. Oops. Hey! This is actually much much much more common than you think. In fact, some figures say that 2/3 of American’s aren’t putting a single penny into their 401k!